Current Market Analysis: The market for Michigan nationals is a little bit soft right now. I wouldn’t call it bad, but it can take a long time to find the right buyer. Banks in suburban Detroit towns are popular. You should also keep an eye out for notes from Upper Peninsula towns. Despite having a small population, lots of people have found memories of vacationing in that area and collect the notes. Today Detroit has a bad reputation. However, at one point in time it was a very wealthy old money type town. Lots of early notes are available from Detroit. Otherwise, anything printed before 1900 from Michigan is likely scarce. Rare notes tend to be found in circulated condition. Choice examples are much more difficult to locate. 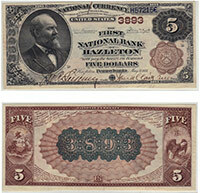 We buy all antique paper money issued by The First National Bank of Greenville, MI. We can tell you how much your $5 bill is worth. We aren’t just dealers. We are also collectors, experts, and appraisers. We have contributed to numerous price guides and are considered specialists in the field of national currency. Contact us via phone or email to get your free appraisal today.